Usually, I can easily spew forth all kinds of observations about movies, and then I’ll agonize trying to come up with a fun title. I’ve had this title and a blank page for over a week, and I’m not sure why. Its late enough that some spoilers probably snuck in. I’ve spoken about having a limited number of Spider-Man comics, and not being as big a fan of Mr. Parker as other characters. 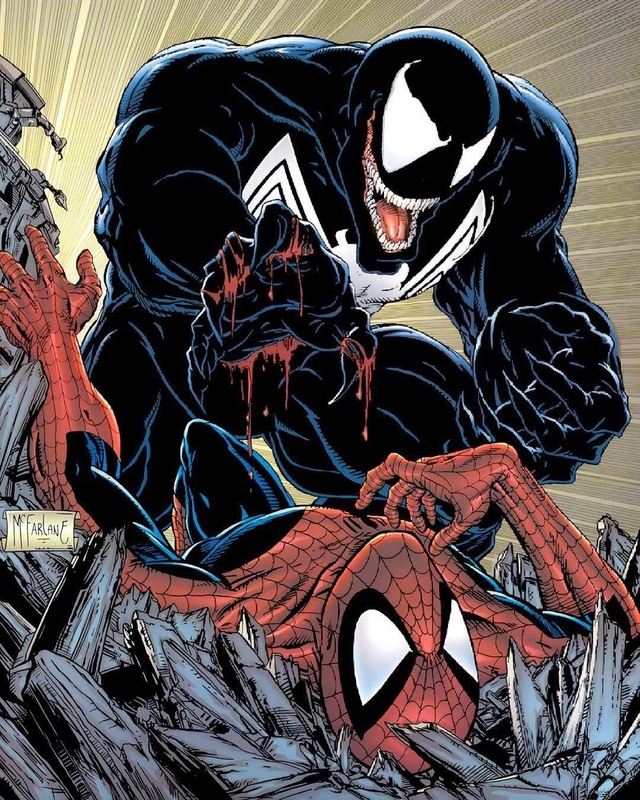 However, since a majority of those trades were obtained in Going Out of Business sales of comic book stores during the crash in the Nineties, a large percentage of what I have are Venom related stories. 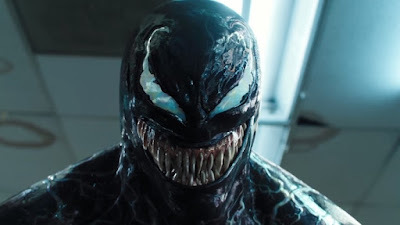 My issues (not comic book issues, personal issues...sorry for the confusion, proceed) may come from the main reasons I really liked the movie Venom were in the ways it deviated from the comic book Venom, which I also like a great deal, for totally different reasons. Venom was a bad guy when he started, and stayed that way for a long time. His main goal was trying to eat Spider-man’s brain, and terrorizing anyone Peter was close to. Except Aunt May of course, she was an “innocent.” Venom slowly morphed into an anti-hero and “lethal protector” who inflicted Punisher like slaughter on those who threatened the innocent. Oh, and he still wanted to eat Spidey. The comic book symbiote learned some real heroism when it was bonded with Colonel Flash Thompson to become Agent Venom. This showed Marvel’s constant fascination with turning a former villain, or in this case, two really unpleasant villains, into a sympathetic and likable good guy and Avenger. Redemption is a big deal for the Marvel Bullpen. Hawkeye, Black Widow, Scarlet Witch, Quicksilver, Vision, Swordsman, Sandman, Wonder Man, and I’m sure I’m missing a bunch more- all started out fighting Avengers before joining them. Making heroes out of normally difficult to befriend individuals goes all the way back to the start of “the Marvel Age.” Tony Stark was created intentionally to make a hero out of the hated military industrial, corporate rich man in the anti-establishment sixties. Movie Venom starts off on, and stays on, the side of right and good the whole time. 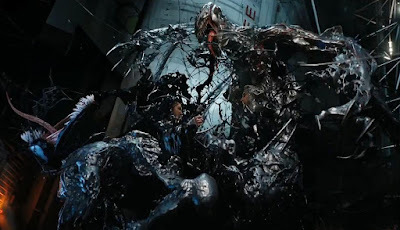 Even fighting a group of policemen when cornered, Eddie controlling the Symbiote shows how the combination of the two of them is becoming a hero. The film symbiote says many comic book Venomy sounding lines. Eddie’s reactions are not standard comic book character fare. Instead, they are how a normal sane person would react to the nature of the Symbiote's requests. This led to one of the biggest deviations from the source material, and they hid it incredibly well in the trailers. The dark humor was the main reason my daughter kept saying, "This is the best movie ever!" 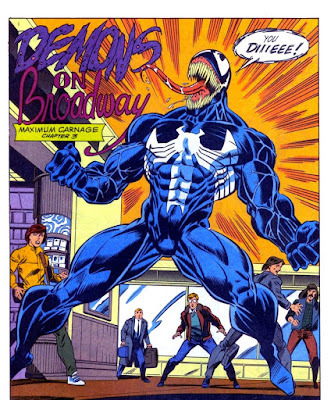 Eddie’s panicked reactions as he’s learning what the Symbiote wants and can do makes it more like an Eighties action/comedy buddy cop movie than a monster film. Or maybe a better example is: it’s like Innerspace but with more head eating. Besides being a bad guy in the comics, Eddie is also a big ole jerk. Before becoming Venom, he gets fired for a reporting incorrectly about a super villain's identity and is disgraced. It was implied the publicity was more important to him than the facts, and he constantly blames others for his problems. 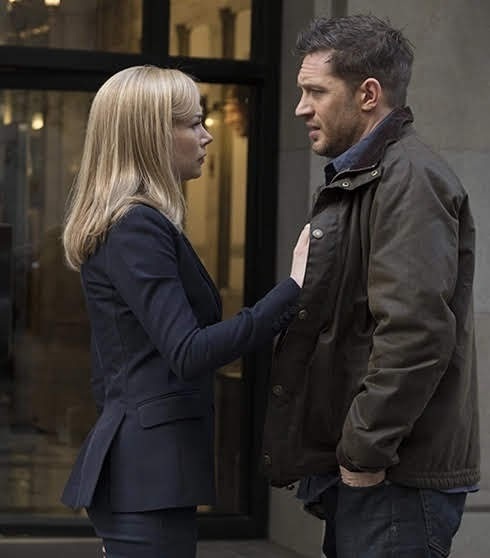 Tom Hardy’s Eddie gets fired for going too far in getting evidence against, and being overzealous at trying to bring down, evil, dangerous, but well connected corporate bad guys. He still makes stupid decisions, but they’re stupid in a more noble way. This is a big one. From its first release I was a bigger fan of the black costume than Spidey’s original suit. (I know, “bad geek, no free comics for you.”) Venom couldn’t exist in the comics (or cartoons, or the Raimi films) without Spider-man. The Symbiote hated Spider- Man for rejecting it, and Eddie Brock hated Peter Parker for exposing his false report. 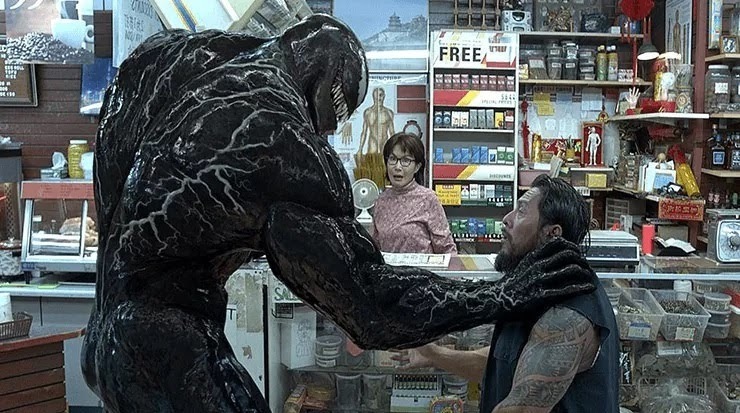 However, since Venom is never a villain in the movie, the separation from Spidey HELPS. With no beloved super-hero that Venom is trying to devour- he’s almost always fighting bad guys. His movement style preserves the more animalistic and fierce wall crawling of the comics, even without web swinging. I do miss the spider logo on his chest though, because it looks awesome. Venom shares something with Ghost Rider, which may be why they’ve had some great team ups …one of the main features of the character is: He looks cool! In fact one of the team ups with Ghost Rider was Spirits of Venom, a cool sounding title that lurked around the Marvel office for quite a while before it found a story. They handled that looking cool thing well on screen. Oh no! They didn’t use Carnage! Of course not. This way they could spend time developing Eddie and the Symbiote more fully. Carnage takes time to do right. The time spent developing Drake (Riz Ahmed) as the corporate villain was shared with time developing the world and the plot line. Riot could be nondescript and come in at the end to add more bang to the final fight. Michelle Williams also had time for development as Anne, and their relationship could go one of several ways as the story progresses in sequels, any of them being satisfying based on the execution. I did keep expecting Hugh Jackman to show up when they showed her though. Then I’d imagine the Wolverine/ Venom version of “The Other Side” and wish for A Very Marvel Musical. Yes, I loved the Deadpool movies. Yes, Logan was amazingly well done. 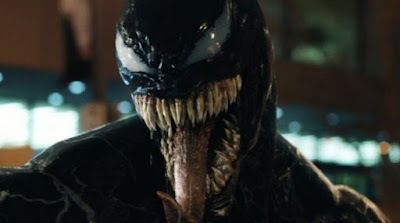 Yes, Venom’s penchant for chomping off people’s noggins like the owl in the Tootsie Pop commercial could lend itself to an R rating easily. But this film should have been PG-13. Venom was funny, but not in the insanely over the top fourth wall breaking way Deadpool needs to be in order to work. That would have taken away from the character and story. 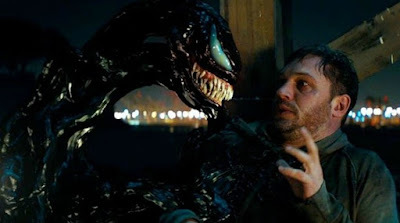 There needs to be some horror to Venom. 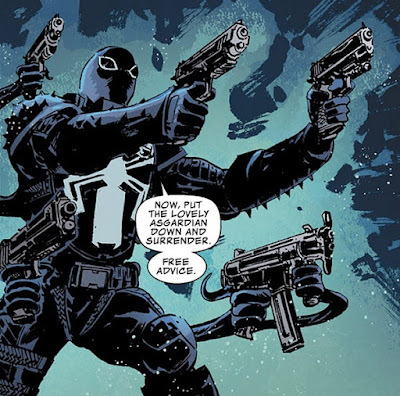 Plus Venom is supposed to be part of the upcoming “Spider-Verse” whether or not Sony works Spidey into it. Sure, Logan was award worthy, but it was also an ending. I guarantee, some ten year old caught Venom on just the right day, and now Eddie is their favorite superhero. That’s how you get into the collective unconscious and build a lasting franchise, you bond with the kids. Along with looking awesome (The only Marvel costume t-shirt I own is a Venom one.) Venom is inherently quotable. Contrary to my hopes, Hardy didn’t use his goofy Bane voice for Venom…alas. The Symbiote did speak in a distinct, memorable, and (in my case) imitate-able way. I now have another line I can use when any boys come near my daughter. Has too much of Richard Moll’s friendly and fun sound to it. and then we will eat your face right off your head. You will be this armless, legless, faceless thing, won't you? Going down the street like a turd in the wind!" I think it’s the face eating part that sells it.